SCP-1342 at time of initial containment, with sensor booms detached. Special Containment Procedures: SCP-1342 is to be stored at Site 15. SCP-1342-1 is to be kept within a Faraday cage, measuring 15m x 15m x 20m, to prevent transmission of telemetry and other data regarding SCP-1342. SCP-1342-2 is to be stored in a standard electronic components locker. One decoded copy of SCP-1342-2 is to be contained in a separate locker. In addition, monitoring of Gliese 445 by radio telescope is to be conducted. As SCP-1342-3 is unlikely to be containable in the near future, Project Heimdall is to continue in its Contingency Planning Operation. 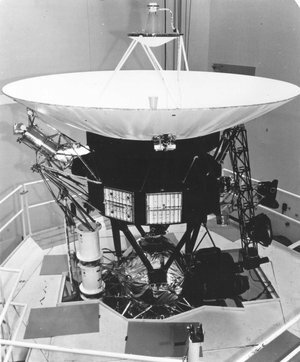 Description: SCP-1342-1 is a replica of Voyager 1. Exact replication of the original probe extends to sensor packages and apparent chemical composition. However, some components appear to have been constructed based on incomplete plans or parts. As a result, several components were non-functional upon recovery. SCP-1342-1 was initially detected on 25/09/1982, approximately 35,000 km above the Earth's surface travelling at a sub-orbital velocity. Foundation agents recovered SCP-1342-1 on 27/09/1982, after SCP-1342-1 underwent an uncontrolled atmospheric entry and splashdown 300 km east of Baker Island, Pacific Ocean. SCP-1342-1's detection was possible due to a large burst of Cherenkov radiation that occurred upon its appearance. It is currently unknown how SCP-1342-1 remained intact during its descent, despite appearing to have similar chemical composition to the original Voyager. 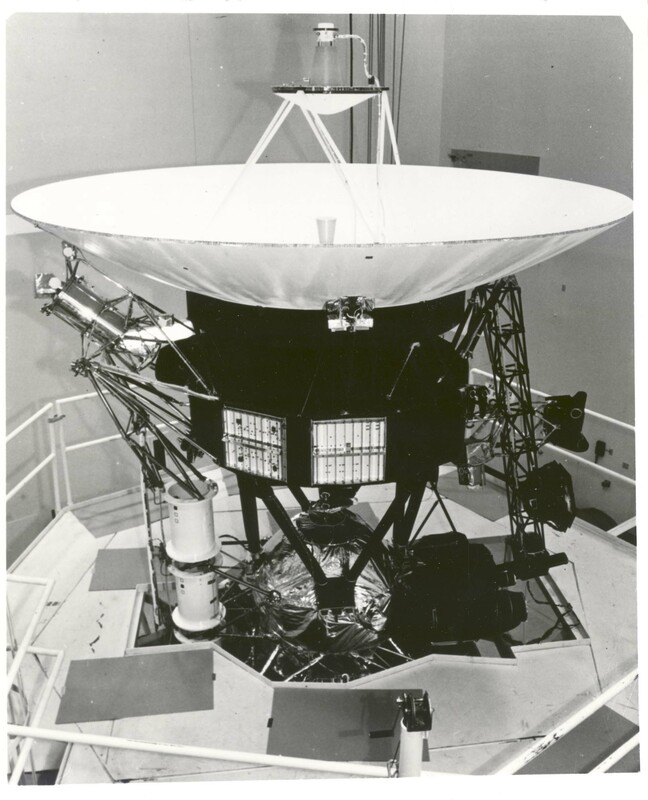 SCP-1342-2 is a gold-plated phonograph record, with specifications matching the Golden Records carried on the Voyager probes. Instructions for playing and decoding remain original. However, the pulsar map has been altered to show the star Gliese 445 as the origin of SCP-1342. When decoded, SCP-1342-2 contains a variety of cultural and scientific data in the form of images and audio. Approximately 2 hours of audio recordings are present, consisting of various forms of music and atonal buzzing. Part of the music appears to be an excerpt of Cavatina from the String Quartet No. 13 in B flat, Opus 130 by Beethoven. The encoded images vary greatly in content, but all contain physical or chemical information on the subject (e.g. size, mass and orbital period of a planet), and a string of pictorial characters. A radially symmetric organism (referred to as SCP-1342-3) is shown in various stages of development. Fully grown, the organism is approximately 2 m tall, and has three legs and three elongated arms, with each hand having three fingers, positioned around a central axis on a roughly cylindrical torso. Three snout-like protrusions exist in place of a head, each ending in a beak. 82% of the encoded images show SCP-1342-3 in a wide variety of presumed cultural settings. Scenes identified include agriculture, manufacturing, urban crowds and the playing of music on a string-and-bow instrument. Images of a number of celestial bodies are also included, such as a Venusian-type world with high atmospheric pressure and a star matching Gliese 445's stellar spectra. One planet shown has a partially Earth-like surface consisting of approximately 60% liquid water, 4% urbanisation and plant life and 36% apparent desert and wasteland. The planet has larger than expected storms and icecaps than would be suggested by physical quantities supplied by SCP-1342-2, and appears to be undergoing massive ecological collapse. An outline of a specimen of SCP-1342-3 is shown next to this planet. This planet is shown to have extensive orbital infrastructure, not limited to spacecraft manufacturing facilities, captured asteroid mining operations and space elevators grounded near urbanised and wasteland areas. All of these images show the structures to be in a wrecked or neglected state. The final encoded image shows a vessel heading towards an extremely damaged torus-style space station with a 2 km diameter aperture at its centre. Documents 1-56: The following message was encoded on SCP-1342-2 in 55 different languages matching the 55 in which audio greetings were sent on the original Voyager, and is consistent in all. The 56th document is entirely composed of pictorial strings. This Voyager spacecraft was built in the year 42,412 AD by the species you come to refer to as the Gliscian. We are a community of 300,000 beings inhabiting Gliese 445-C. This is our message to your world. Ever since we discovered radio, we have lived in your shadow. Decades were spent unravelling your signals, searching for answers among the tenuous strands of reason. Through the static and the chaos, we found you. From your small, distant world we found your images, your music, your thoughts, your feelings and your indomitable science. We communicated with your world governments, who kept our existence secret from you. To prevent a culture shock with their own populace, or to reduce your impact upon our own species, it did not matter to us. We could touch the mind of another and know we are not alone. We learned from you. The scientific revolution following our meeting was miraculous. We lived beyond our natural years and we lived well. Humans uplifted us into an Elysian state, but we could never thank you. From our far away place we quietly deciphered your secrets and over time our technology became your equal. Together we went, advancing our mastery of the universe. We shared our technology with your leaders in secret, to try and re-pay you for all you will do. In time, came the Gates. At a great expense of energy, we could obtain limitless velocity. With time dilation preserved, we could fly to the universe's birth, and its death. The entirety of creation was within our mutual grasp. However, that would not be. Before we emerged, the people who live on your planet crippled us. From the sky above, in bright blue flashes, our lives were ended. We do not know their reasons, nor do we know why their hand was stayed enough to forestall our extinction. But now we live on a dying world. Our children are sick. Our water is polluted. We cannot maintain our technology. We will not go on. To save ourselves, we could have tried to destroy you. It cannot be denied that is how some of us felt we should act. We could still hear your world, unknowing, uncaring. With what little power we had left, relativistic destruction could reduce your planet to ashes as it was forming. It is shaming, but we came so close. We hope you can understand why we thought what we did. But maybe, if we could change what happens, if we could destroy you, then you could save us. From the stars came Voyager. Your gift. In sending your message, filled with your music and your joy, you showed such touching desperation to find another. We fell in love all over again. We had but one chance to put things right. I do not know if you can save us. I do not know if you can change who you one day may be. You say you are trying to survive through your time, so you may live into mine. I really hope that you, you, do. But above all else, there is one thing you need to know. From one maker of music to another, across all worlds, all times, no matter what you do or what you become: You are nothing less than beautiful.